Before entering into a currency position, a trader has to know what is the market climate. We call this classifying the market, i.e., assessing whether the movements being seen are trending, rangebound, flat, random, or volatile. The two easiest markets to ascertain are trending markets and rangebound markets. It is intuitive to tell if a market is trending or rangebound. If every day, a trader walks in and USD/JPY is 50 points higher (i.e., up from 103.00 to 103.50 to 104), it would be easy to think that the pair was trending higher. Similarly, if USD/JPY kept bottoming at 101 and topping out at 105 over a period of several months, this would be viewed as a rangebound market. Markets are trending or rangebound probably 90%, maybe even 95% of the time, although you can cause a fistfight by asserting any specific number. Retail traders and traders in general can make money most easily in these types of markets. Traders, however, supplement their intuition with a variety of momentum indicators to tell if markets are trending or rangebound. These include the average directional index (ADX), Bollinger Bands, relative strength index (RSI), and moving average divergence (MACD), subjects covered in our previous lessons. If the ADX, which measures the strength of a trend, is 30 or higher, this suggests that a currency pair is trending (could be higher or lower). An ADX over 40 would indicate a very strong trend. 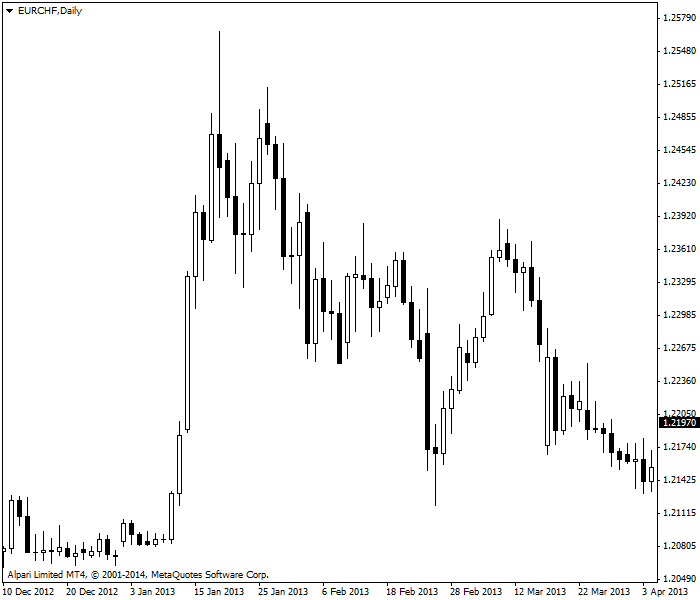 If the ADX is below 10, it would suggest that the currency pair is rangebound. Similarly, if RSI is rising or if the MACD line is moving higher, the currency pair would seem to be trending. If the Bollinger Bands are widening, this suggests a trending market, whereas if the Bollinger Bands are narrowing, the currency pair is likely rangebound. See the chart below. You do not need an indicator to verify by eye that the currency is trending, and in a tidy way. 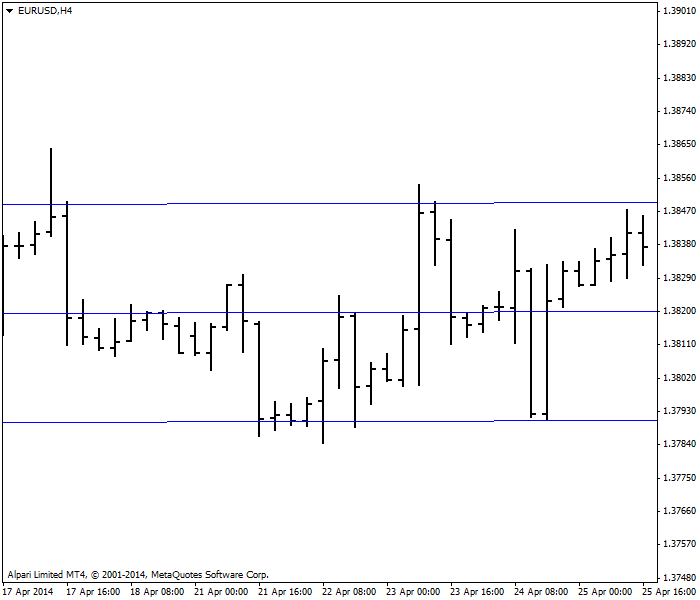 In contrast, the chart below shows a range-trading environment, with the horizontal lines marking the outer limits. Flat markets drive currency traders crazy, because it is very difficult to make money in such an environment. This type of market, where currencies hold such tight ranges that the action looks fairly flat on a chart, is often seen during summer holidays or during the various holiday seasons throughout the year and sometimes into year-end, when profits have already been made for the year and no one wants to place trades that would jeopardize profits. Please see the next chart below. On this chart, we drew a linear regression line to emphasize that this section of the chart has zero trendedness. The high-low difference is also very small. Sometimes, an important data set surprises, or a key central bank decision is unexpected, and the market sees a sharp move one way or the other. In the wake of this, market players do not want to buy (or sell) at current levels, and want to wait for new information before trading again. This may take only a few days or as much as a month (e.g., employment indicators), but flat or tightly ranging markets may be seen under these circumstances. Carry trades often work well in this environment because a trader can pick up the interest differential each day and make a profit especially if the underlying FX pair is holding steady. Random markets could occur during a trending market, but most often take the market by surprise. A currency pair, such as EUR/USD, could be trending higher and with all momentum indicators suggesting a move to 1.4000, for example, where a host of resistance points are found. 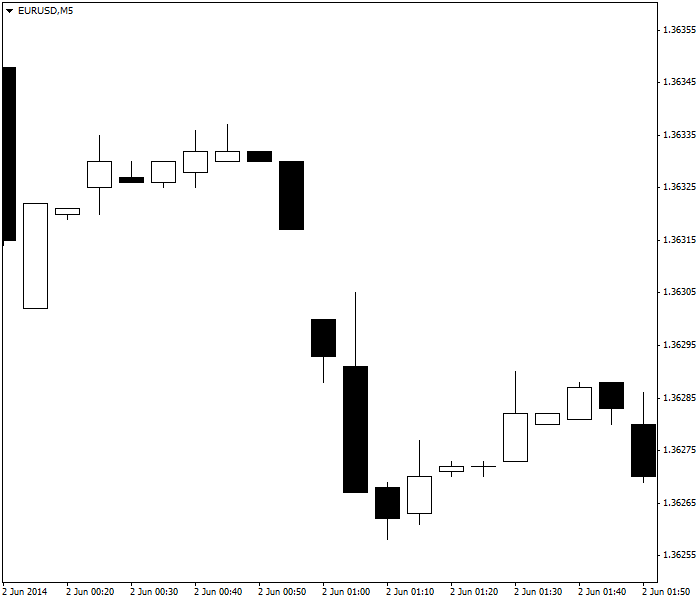 Traders would assume that the trend would run out of steam or at least stall around 1.4000. Some unexpected news comes out, and the euro breaks above 1.4000 and rallies further to 1.4200. There are times where an FX pair sees what is called a key day reversal, which occurs when prices reverse course during the day. For example, a currency pair might break above the previous day’s high, suggesting scope for an uptrend, only to later fall sharply and close below the previous day’s low, suggesting scope for a downtrend. See the chart below, which shows a random move, in this case an opening gap, which is common in some securities (like the CRB index and gold) but is very rare in Forex. Unexpected occurrences (media headlines, data sets outside of expectations, unforeseen central bank decisions, large orders) happen from time to time and cause an FX pair to break key support/resistance point (Fibonacci resistance points, 55, 100 or 200-day moving averages, etc.) prompting market players, especially black box and other model types, to enter the market to either reverse their position or to enter into a new position, which reflects the current trend. Volatile markets are extremely rare and are driven by a shocking event. In the past, these have included an assassination or assassination attempt on country leader (US president Ronald Reagan in 1981), the 9/11 attacks in 2001, and Japan’s earthquake and tsunami in March 2011. Another example would include the wild deleveraging seen at the start of the US financial crisis (late 2008 into early 2009), where banks and companies were selling profitable positions in all asset classes to offset the losses made in sub-prime mortgages or mortgage related assets. In times of volatile trading action, having no position is the best position. See the figure below, where the currency is displaying high volatility, most noticeable in the extreme high-low ranges on some days. EUR/CHF displays a lot of volatility on daily chart due to Swiss National Bank's decision to cap the currency pair's rate at 1.2000. Did you know? While currencies do not often exhibit cyclical trends, there are times when investment flows either favor or work against a given currency. Japan’s fiscal year-end is March 31, and in the past, the yen used to benefit greatly from repatriation ahead of fiscal year-end. With mark-to-mark accounting, these flows have diminished, with less effect on the spot market. Another example is the farm subsidies that the European Union pays to the UK farmers (typically paid in fall), which can at times weigh on EUR/GBP. 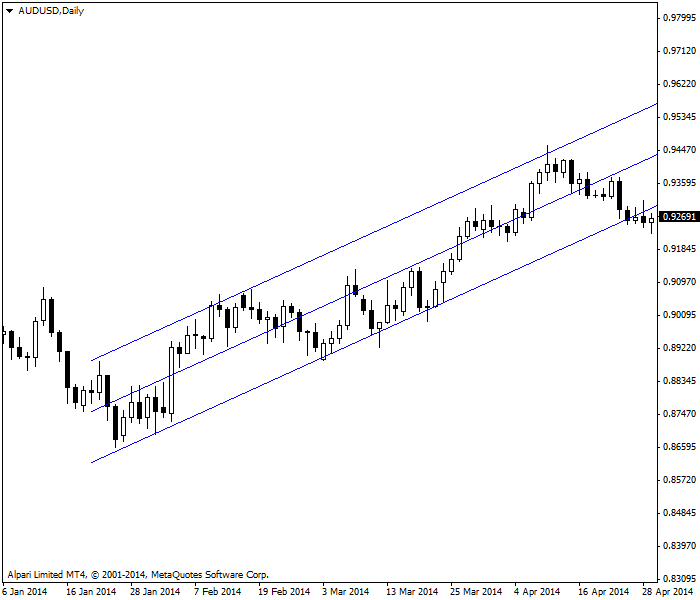 USD/JPY was showing a strong trend higher. USD/JPY was seeing waning momentum. 4. 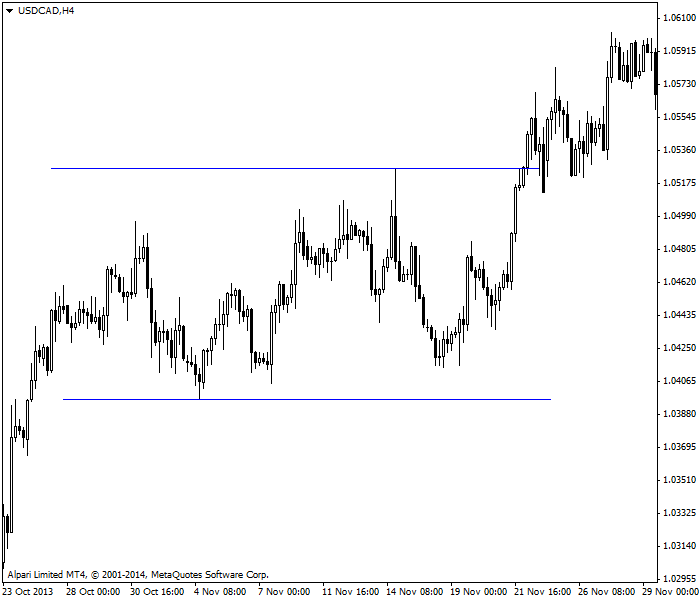 What special kind of trades are usually profitable in flat FX markets? Going long the dollar and short stocks. 5. Position of what size is the best to have in volatile markets?